Post Grad School Plans: With a background in Gerontology, I am committed to improving the healthcare system for the aging population. As a future occupational therapist, I am passionate about working in the field of geriatric mental health. Utilizing occupational therapy (OT), I plan to support persons with dementia, along with their caregivers, to age successfully in their homes and maintain function for as long as they are able. Why Western Occupational Therapy: One of the many reasons I chose the Western program, was for its stellar curriculum, which provides opportunities to learn outside the classroom beyond the required fieldwork placements—setting it apart from other OT programs. Through their partnership with the Oslo and Akershus University College in Oslo, Norway, Western has supported my interest in studying abroad for a course credit. In addition, the program fosters learning between students and practicing clinicians in the field, through both their mentorship and intensive programs. This provides additional opportunities for networking, applying knowledge learned beyond the classroom and transferring it to clinical practice. The best thing about my program: From the very first day of class, we are told “OT is a calling”. Now, having experience in the program, I certainly believe that! In a small class of 60 students, the best part of the program are the students that make up the school; I have never been part of such a supportive network of peers, who are so talented and knowledgeable, given everyone’s different educational background. Because of these diverse perspectives, the classroom experience has been enriched, as we have many opportunities to collaborate and learn from each other! The people/culture in the MScOT program are...: The people in the program are supportive, compassionate, respectful, and intelligent! We all are working towards a common goal of becoming occupational therapists but we all have different interests we want to pursue. As a class, we motivate one another to work hard and be successful in this fast-paced program! 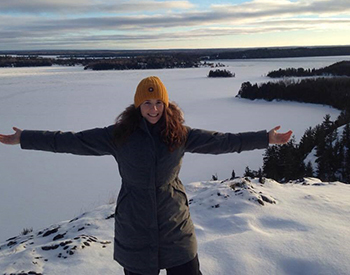 My most memorable experience as an OT student: My northern fieldwork placement in Sioux Lookout, Ontario has been the most memorable experience to date. Made possible by Western and the Northern School of Medicine, this experience broadened my awareness of the northern healthcare culture and exposed me to new learning opportunities that I would not have experienced in southern Ontario. This has caused me to consider the vast employment opportunities beyond the London area and has extended my OT network. Advice to students considering studying OT at Western: Occupational therapy is a very rewarding profession and Western is a leading school in the field. The University prepares students to reach and exceed their career goals! Faculty and students alike, work collaboratively to ensure an optimal learning environment is achieved and that learning requirements are met. Before applying, consider performing research to see if the school’s values, philosophy and curriculum model aligns with your vision.